The Police Interceptor is powered by a 4.6-L overhead cam V-8, one of the most advanced engines in its class. Governed by a sophisticated engine control computer ( the EEC-V ) it features distributorless ignition, plus electronic fuel injection. For the kind of performance required in real-life situations, this powerful engine is matched with a 4-speed electronically controlled automatic transmission with low-gear lockout. For durability, the Police Interceptor features a corrosion-resistant stainless steel exhaust system; heavy-duty drive shaft and U-joints and a heavy-duty electrical system. Severe-duty 4-wheel disc brakes are standard. Optional 4-wheel anti-lock braking features Electronic Traction Assist for improved acceleration and stability on slippery roads and improved grade-climbing capability in ice and snow. Body-on-frame construction and a uniquely tuned suspension produces the legendary Crown Victoria ride. Computer-controlled "speed sensitive" steering provides greater power assist at low speeds and improved road feel at higher speeds. 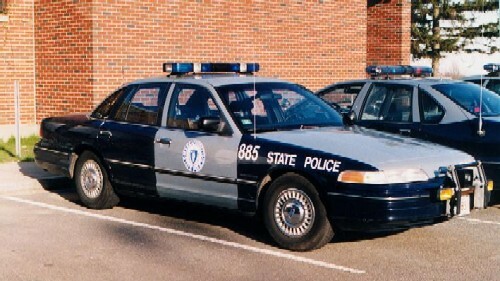 The Crown Victoria Police Interceptor is equipped with a tilt steering wheel; a certified calibration 140-mph electronic speedometer; map pockets; power windows; an instrument cluster which includes a voltmeter, oil pressure, water temperature and fuel gauges; an illuminated glove box; dual power remote control side mirrors. And more. Within the spacious interior there is plenty of room to store and mount auxiliary police equipment such as computers, videos, radios and weapons. Because of the standard, dual driver and right front passenger air bags, the proper installation and storing of this equipment is critical. See your Ford Fleet Representative for information on the proper placement of interior auxiliary police equipment. 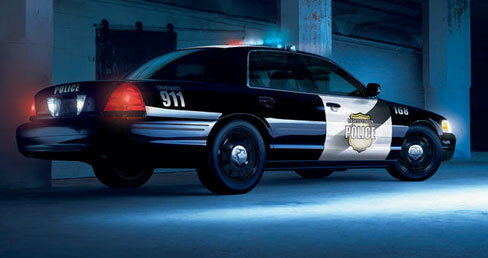 Copyright © 2004-2012 PoliceCars.us. All rights reserved.